Knee deep in history this week, I spent a fascinating day out at Vindolanda, on Hadrian’s Wall in Northumberland. Come and walk with me, in Roman footsteps. 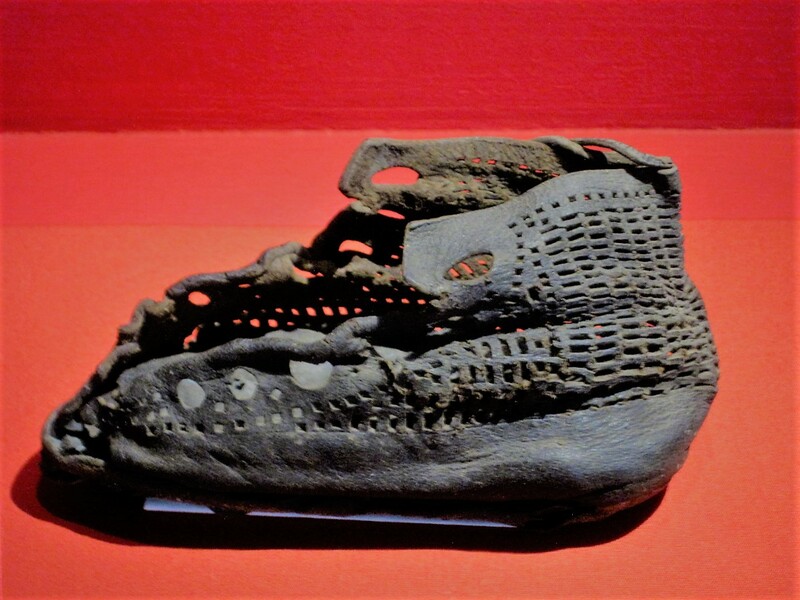 Can you believe, this tiny child’s boot, found here on this site, is from Roman times? 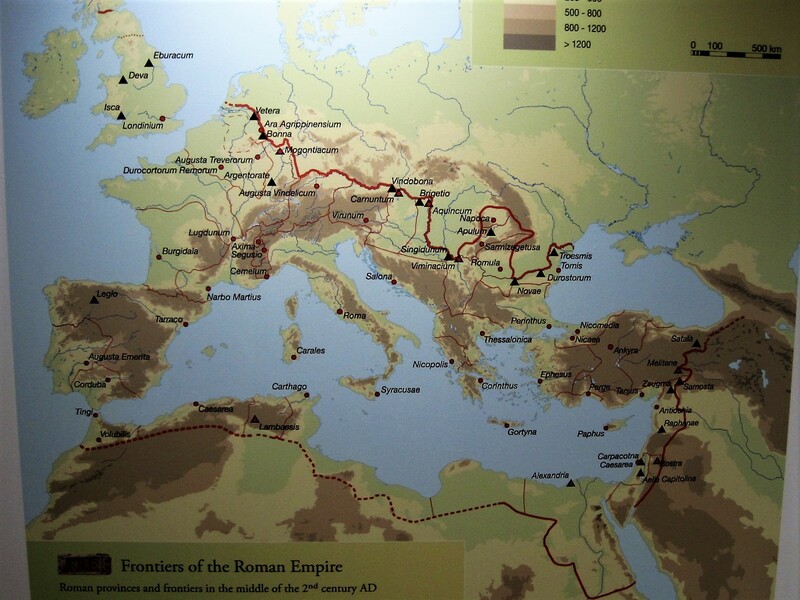 At the edge of the Roman Empire, the Wall was to stretch 73 miles across Britain, from coast to coast. A formidable undertaking! The garrison at Vindolanda was the first of a series of bases enabling the Wall to be built, and then defended. The name means ‘white field’ or ‘white moor’, and I can testify that freezing conditions are often to be found at the border in winter. On a warm Spring day, the beauty of the surrounds was what struck me first. But I’m getting ahead of myself. Let’s build the suspense a little. What might I find here? 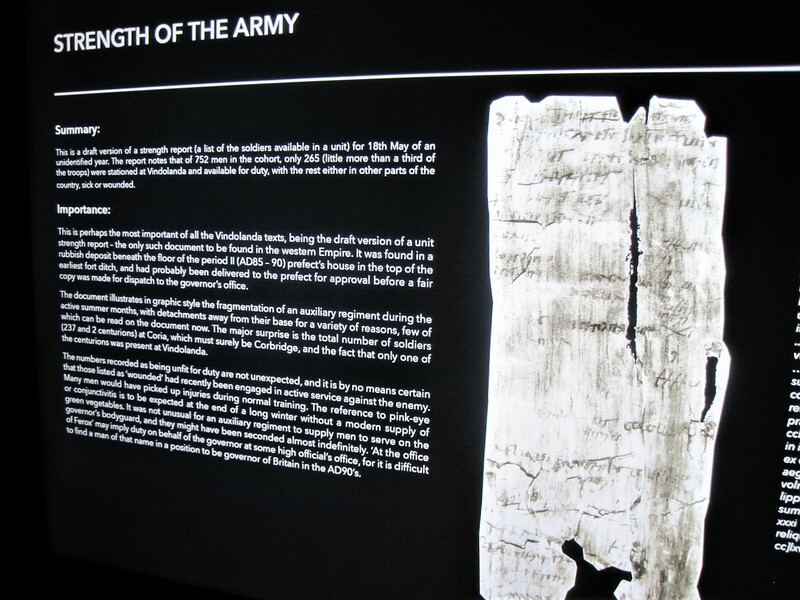 I had, of course, heard all about the Vindolanda Tablets– telling scraps of bygone lives, written in ink on wafer thin slivers of wood, they are the oldest surviving hand written documents in Britain. But what would they look like, and how did they come to be still intact after almost 2000 years? This UNESCO World Heritage Site has ongoing live excavations, and it was incredible to watch history being unearthed before my eyes. Meet Graham, and his merry team, and let him enthrall you with tales of some of the finds from the 14 years he has been helping to excavate this site. The twinkle in his eyes can’t disguise the passion he has for this very special place. The stories will give you goosebumps. It was from Graham that I first heard the explanation as to how well preserved everything was. The first 4 forts here were made of wood, but over time they were demolished and 5 new stone forts were built over the top. Each layer of new building sealed the previous levels, creating anaerobic (oxygen-free) conditions, effectively preserving them from decay. An unbelievable 6000 items have been recovered so far. As they continue down they hit further pockets of discovery, adding to the already amazing haul. Throughout the site information boards help you to reconstruct what once stood there. The Romans were very resourceful, channelling water from nearby streams in stone aqueducts or timber pipes. They had underfloor heating systems, steam rooms and communal but comfortable toilets. It was a well-ordered society with a recognised chain of command and luxurious, for the times, quarters for the Governor and his guests. It is believed that the Emperor Hadrian himself once stayed here. On the Vindolanda website there is a detailed timeline and enough information to keep you reading for a considerable time. I can only skim the surface here. The Romans arrived in the mid AD70s and were here for more than 300 years, building and rebuilding a sequence of forts and, from AD120, Hadrian’s Wall. When the Romans withdrew from Vindolanda it continued to have a life for a further 400 years, before falling into decay. It is a spectacular site, built on a hill, and would have been easy to defend. Follow me down to the reconstructed Temple of the Nymphs, in the valley below. The Romans worshipped a number of gods, Jupiter, Mars, Mercury and Neptune among them. The wall paintings inside are based on examples at Pompeii and Herculaneum. The museum is in a beautiful setting, in what was formerly Chesterfield Cottage. 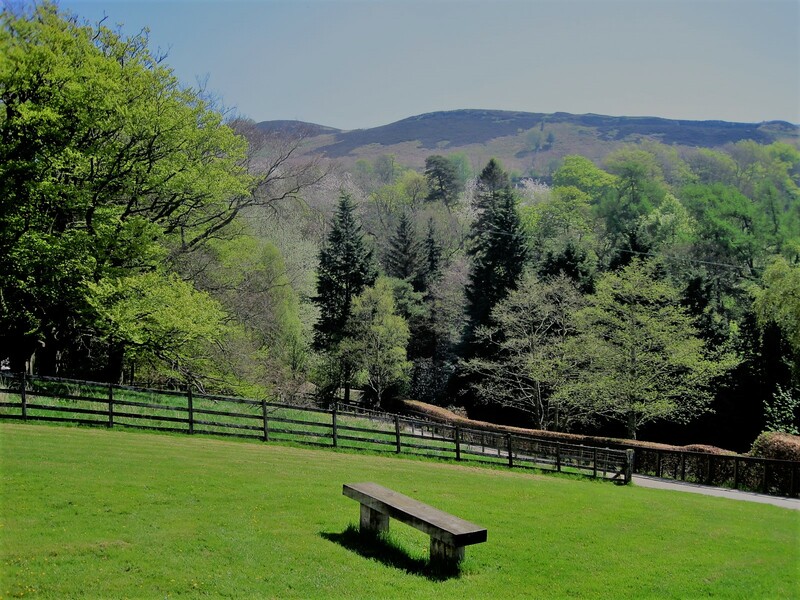 It was purchased by Vindolanda Trust in 1974 and has been extended and modernised, and includes a very friendly little restaurant. If you can make it here, I cannot recommend it highly enough. One of the collections that I found extraordinary was the shoes. I had no idea that the Romans had so much choice in the range of footwear available to them. (especially if they had plenty of money) Coloured socks are believed to have been worn with the latticed style, to highlight the pattern. 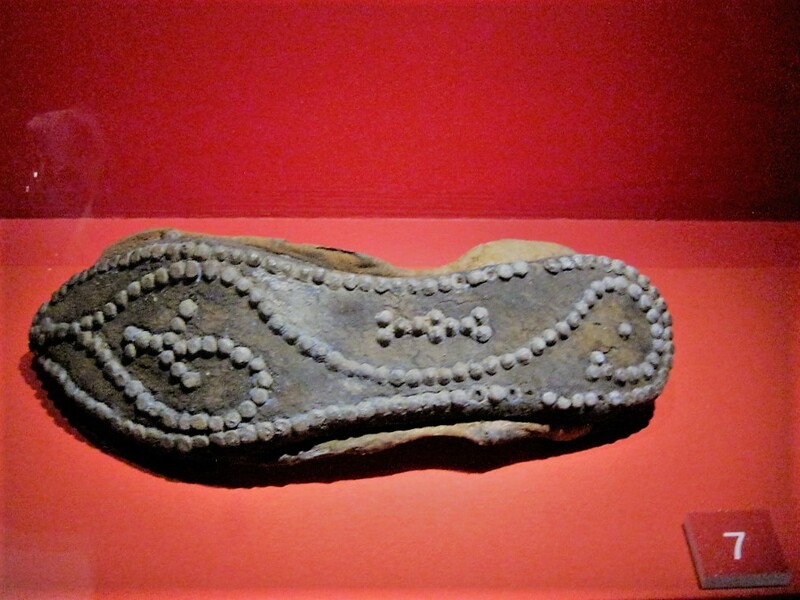 The soles were studded to prolong wear, children’s shoes being a smaller version of adult footwear. Whatever attracts or interests you, I’m sure you can find something to marvel at, be it fine bronze armour, worn by the legionaries, oyster forks, a range of keys, painted glass from the Rhineland or the military standard and horse brasses of a cavalry troop. Goods were made locally by craftsmen but were also trafficked throughout the mighty Roman Empire. Leather for clothes, shoes and tents for the military was produced at Vindolanda, and woodworking was an essential craft. A workbench belonging to ‘Atto’ bears his carved name and the punch marks from his tools. Another compelling recent find is a pair of ancient ‘boxing gloves’, probably used by a soldier during fitness training. In a darkened corner I finally find what I’ve been looking for. 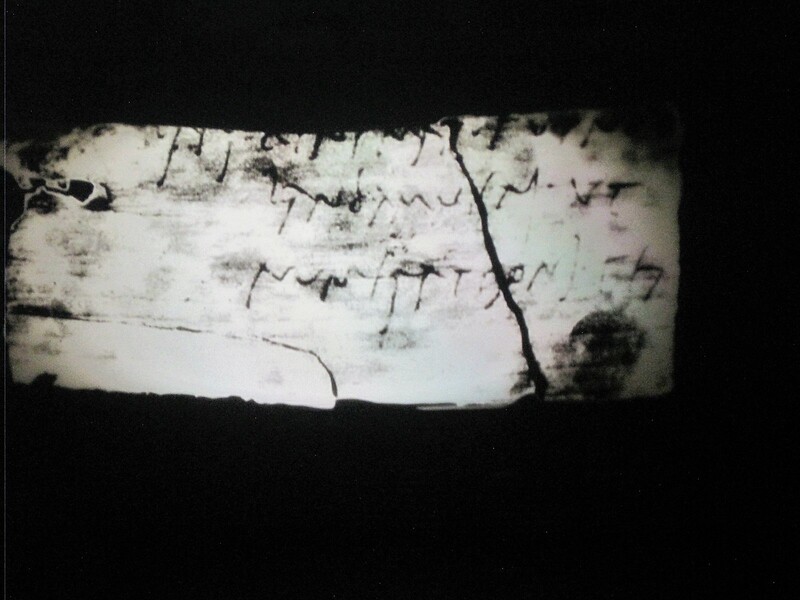 Described as ‘postcards from the past’, the Vindolanda Tablets inspire awe. I peer into the illuminated cabinets, trying to decipher the writing from a world 2000 years ago. Defeated by language, I gaze numbly through the glass. Many hours have been spent transcribing these events from everyday life, and many more could be spent reading them. Finally I pull myself away, and head back outdoors. Clouds have scudded in and I feel the chill that must once have settled on Roman bones. I linger just long enough to climb one of the wooden forts, hoping to find a degree of shelter from the wind. Looking down on the remains of a bathhouse, I shiver and then march briskly, back to the car. I hope you enjoyed this venture back in time with me, and can only urge, if ever you have the chance, that you visit. The rewards are rich. Full access details for Vindolanda and the Roman Army Museum (to follow) are on the website. Another bumper crop of walks to share with you this week. Many thanks to everyone for their efforts, and for many hours of pleasure. Join me any time on Jo’s Monday walk. You’ll be very welcome. Definitely time to put the kettle on! Grab a coffee next, and go look at some books with Janet! And what is it about villages with a stream running through? Join Eunice on a sunny day! It’s another sunny morning here in the north east, and I shall be making the most of it. Have a great week, everybody! crikey if this was within driving distance I’d be there today. How incredible. Not sure I’d want to ever leave, so much to take in. It’s an amazing site, Becky. Maybe you’ll have to carry on from Bishop Auckland. 🙂 🙂 I really loved it. Hiya darlin 🙂 🙂 Just put the laptop on and there you are! This place is fantastic, Madhu. I’ve been up in Northumberland again today, but at gardens this time. 🙂 Feeling quite deflated as I’ve cleaned and stuff all day then the viewers arrive and 10 minutes later you’re back where you started. Heart goes out to you. The viewers coming and going can be very unsettling – to say nothing of the endless round of keeping the house tidy. Good luck! Jo this is such an intriguing walk today. I have often thought I would love to volunteer at a dig site. I suppose it is not as exciting as it seems but how exciting to find ancient artifacts. I’m fascinated by everyday objects from the past, so the shoes really caught my interest. Jo, you do take us to the most amazing places. I am particularly fascinated by the shoes. Aren’t they incredible, Ann? There was a cabinet full of them, and many more in storage. On the website they have just discovered another this week! 🙂 🙂 I may be running out of fizz soon. I think I need a little time away from blogging.